I don't have a picture of it... and i still don't have enough posts for it. But, khuno decides that even though he's out of pee, he still wants to mark every single tree he sees... he tries so hard to mark but nothing comes out. The thing i really want a picture of is when he tried to mark on another dog... luckily he was out of pee that time too. The other dog looked at him like, "you've got to be kidding me". I felt really bad and i apologized to the other dog owner, but he thought it was funny so, no harm no foul. woohoo! 100 posts for me which means I better try and get a good pic for this month's theme! I'm so excited !!!! woop woop! Need to snag a shot of Luna doing something snazzy! I don't have a 100 posts, so we can't play officially. 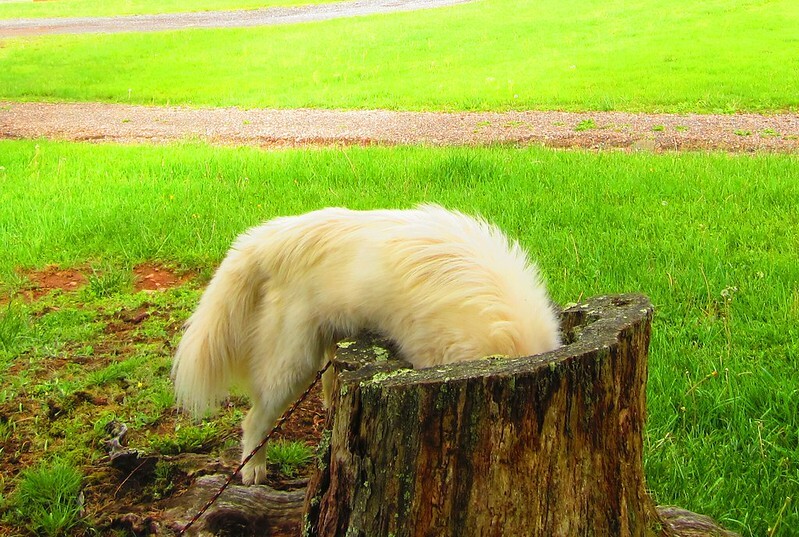 but un-officially, massak is for some reason very drawn to this stump we pass on our morning walk before work, and tries to crawl in every day! I don't have a husky to enter! I love that photo of Massak! so i didn't get to take a picture of it.. but something happened last night that surprised the crap out of me. I was laying down on the floor, and it was late so i yawned. Next thing i know, Khuno is full out sprinting towards me and decides to stick his tongue in my mouth. I didn't feel his tongue IN my mouth, but i felt the sides of it on my lips and i knew the rest was in my mouth..
i jumped back and looked at him like WTheck and he had the most innocent look on his face. It was like he was thinking "i know what you just ate for dinner... and i wanted some but you didn't give me any. So, i thought i'd try to see if there are any bits left on your teeth." love the picture of Faolan though! Oh Jack had done that sneak tongue to me to while im in the middle of talking and were on the sofa, YUCK!!!! love that pic of massak! Everyone is posting great pictures of Dogs doing the Darnest things. I really don't have any of Blaze?? He did something the other day at the dog park was playing tug with another dog with one of those balls thingy that has holes in it.. well he ended up with it then layed down on the ground with it stuck in his mouth and proceeded to pant with it hanging. 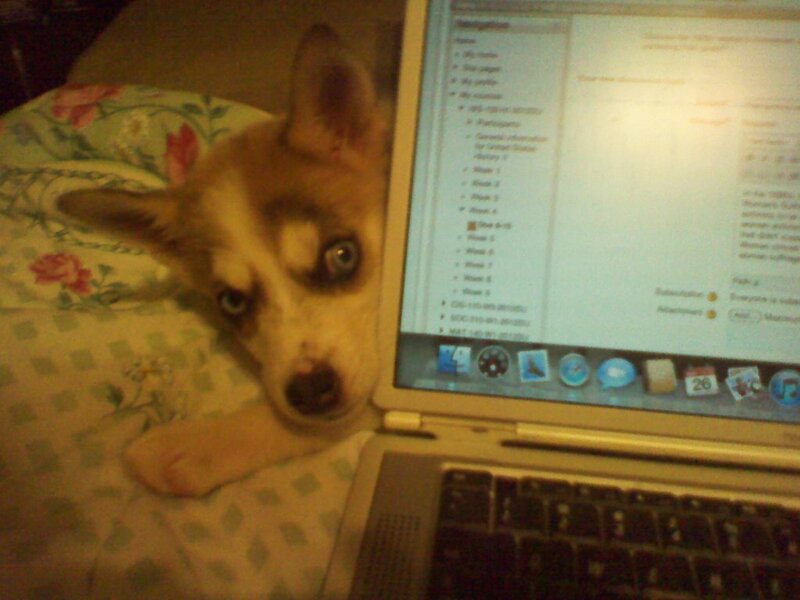 Aurora hiding behind the computer. There was a crack btw them computer and the headboard of the bed and she squeezed her body into the crack and then stuck her head out.